Although Malayan tapirs look more like anteaters or pigs, they are most closely related to horses and rhinoceroses. Their short, fleshy snouts help them sniff their way through the forest and pull vegetation to their mouth so they can browse on leaves and twigs. Tapirs use their flexible snouts to grasp saplings, leaves, twigs, and aquatic plants. They follow a zigzag pattern when feeding, taking only a few leaves from each plant. Tapirs love water and are excellent swimmers. They can be found living in grassy areas near lakes and rivers in the dense rainforests of Thailand, Malaysia, and Indonesia. Calves are born after an unusually long gestation of over 13 months. Except for a mother with her offspring, tapirs prefer to live alone or in pairs in the wild. When threatened, these shy animals head for water or run into the bush. One of the most endangered animals in Southeast Asia, Malayan tapir populations are declining due to habitat loss from deforestation for agricultural palm oil plantations. Palm oil is used in many food products, cosmetics, and bath products. You can help save tropical forests that are home to tapirs and other wildlife by purchasing products that use sustainable palm oil. Learn more and pick up a shopping guide by visiting our Act for Wildlife page. Head & body: 5-7 ft.
Planning enrichment for any species begins with how it lives in its natural habitat. Tapirs live in the jungles of Southeast Asia, usually near ponds or streams. In the wild, they spend a fair amount of time in water in order to feed and digest their food and sometimes to escape from predators. The zoo’s tapirs have a large pool in their exhibit as well as smaller individual pools in their holding rooms. Sometimes keepers put logs or food treats in their pools for enrichment. Wild tapirs are primarily browsers, meaning they prefer the young leaves and growing branches of a few plant species. At the zoo they eat a commercially prepared pellet, as well as apples, carrots, greens, grass hay, and alfalfa. To satisfy their need to “browse,” they also enjoy getting fresh clippings of willow, ficus, and bamboo. Bananas are a tapir favorite. By hiding small pieces of banana in the exhibit, keepers encourage tapirs to put those cool noses to work! Sometimes banana extract is used so the tapirs don’t get too many sugary snacks. In addition to the fruit, tapirs also enjoy eating the stem and leaves of the banana plant, too! These 800 lb. mammals are nearly invisible in the wild. Tapirs are nocturnal, and in a moonlit rainforest the contrasting colors break up its body outline in the dense vegetation and shadows. The tapir’s excellent sense of smell makes up for its poor eyesight. And although this creature is not closely related to an elephant, it uses its long snout a lot like a trunk. 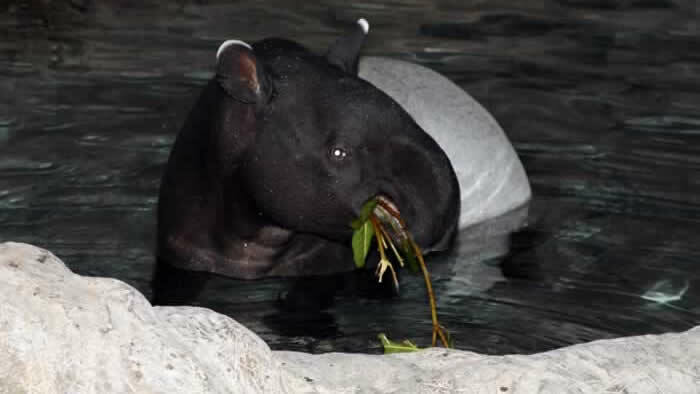 In the wild, tapirs have been observed walking under water, consuming aquatic plants like a hippopotamus, and using their snout like a snorkel. 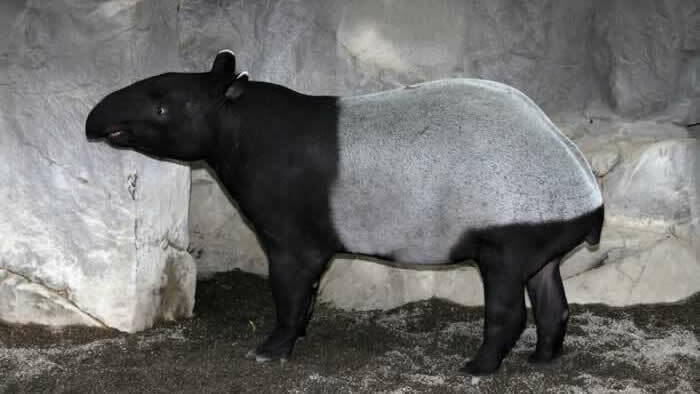 Malayan tapirs are easily identified by their markings. Except for the white tips on their ears, the hair on their front and rear is black, with a light colored “saddle” across their middle. The biggest threat to the survival of the endangered Malayan tapir is destruction of its habitat for agriculture. Although local traditions and beliefs limit their hunting, tapirs are often unintentionally caught in poachers’ snares set for other animals. In 2008, the Minnesota Zoo supported the 4th International Tapir Symposium in Mexico. This symposium brought together researchers and zoo staff to promote communication and education about tapir ecology, behavior, care, and conservation. In captivity the Malayan tapir is managed for breeding purposes by a Species Survival Plan (SSP), which, through the coordinated efforts of several zoos throughout the United States, helps maintain the captive gene pool for the future aid of the wild population. The Minnesota Zoo currently participates in 23 SSP programs, including the Malayan tapir SSP. 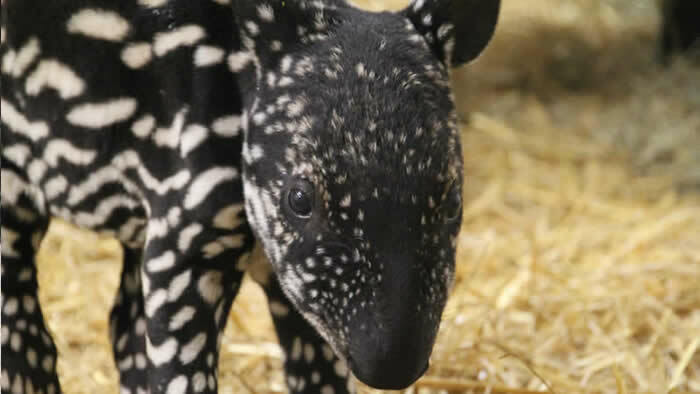 Since 2001, our zoo has birthed 5 Malayan tapirs that have gone into the SSP pool, and we hope to breed more soon.